Prior to Game 7 of the 2006 NLCS, there was much debate over who Willie Randolph should give the ball. It was Steve Trachsel‘s turn in the rotation, but he was terrible in Game 3 and bad in the NLDS. Possibly, it was the result of the microdiscectomy he had in 2005, but he didn’t have in anymore. Due to the rainouts in the series, Tom Glavine in one day of rest was a non-starter leaving the Mets unable to throw their best (healthy) pitcher in a winner-take-all-game. As a result, when you broke it all down, the Mets best option was Darren Oliver Perez. That’s right, it was some combination of Darren Oliver, the former starter who was brilliant in the Mets bullpen in 2016, and Oliver Perez, the pitcher who did just enough to win Game 4. With Perez not being nearly as good as he was as his 2002 breakout season, and him starting on three days of rest, this truly was an all hands on deck type of game. Looking at the game, it made sense to put the Mets bullpen front and center. The Mets had the best and deepest bullpen in the National League. That bullpen led the National League in wins, ERA, and fWAR. It was dominant, and even with the hiccups in Games 2 and 5 in the series, you certainly trusted it much more than you trusted anyone in the rotation. As we are aware, things turned out much differently than anticipated. With the help of Endy Chavez making the greatest catch you will ever see, Perez would allow just one earned on four hits in six innings of work. He went far beyond what anyone could have anticipated, and really, he put the Mets in position to win that game. Ultimately, the Mets would lose the game and as a result the series for two reasons. The first was the Mets offense didn’t deliver. After Endy’s catch, Javier Valentin struck out with the bases loaded, and Endy did not have more magic left for the inning instead flying out. In the ninth, Cliff Floyd struck out, Jim Edmonds robbed Jose Reyes, and Carlos Beltran struck out looking. The second reason was the bullpen, specifically Aaron Heilman. He pitched a scoreless eighth, and he started off the ninth well striking out Edmonds. After the Scott Rolen single, he really was through the dangerous part of the lineup. He should have gotten through that inning unscathed to give the Mets a chance to walk off. Realistically speaking, no one could have anticipated what came next. In 2006, Heilman did not get hit hard. He yielded just a 4.4% FB/HR ratio, and he had a 0.5 HR/9. He had not given up a home run since July 16th, and that was hit by Phil Nevin. Again, no one could see Yadier Molina‘s homer coming. That didn’t stop it from coming, but just because it came, it did not mean Randolph and the Mets made the wrong decision trusting Heilman. Sometimes, you make the right decision, and the wrong thing happens. It is what we saw happen last night with the Athletics. Like the 2006 Mets, the real strength of that team was the bullpen. In a winner take all game, Bob Melvin put his faith in them. Ultimately, it was two of his best relievers, Fernando Rodney and Blake Treinen, who failed most. They took a close game and put it well out of reach. That doesn’t mean he was wrong to trust those arms for one game. It just means the team’s best players didn’t perform, which is the reason the Athletics lost. Really, it was the use of an opener or the bullpenning. It was Rodney and Treinen, two pitchers who were definitively going to pitch in the game even if the Athletics used a traditional starter, who lost the game. In the end, there is still a debate at the merits of using an opener or bullpenning, but the Athletics losing this game did not settle this debate. Not in the least. These are the types of games that have traditionally tripped up the Mets. Day games. Get away games. Games with a rain delay. All of those things combined have always seemed to get in the Mets way. Harkening back to 2015, these were all present in the fateful loss against the San Diego Padres which nearly derailed the Mets season. Those conditions were present today. With rain waiting, the game had a delayed start until 2:45. Initially, all seemed well for the Mets. Yoenis Cespedes hit a monster two run homer off Aaron Nola to give the Mets an early 2-0 lead. Noah Syndergaard would start the game striking out five Phillies over the first two innings. Then, all of a sudden, everything would come off the rails in a 36 pitch third inning for Syndergaard. The odd thing for Syndergaard was even though he was in trouble he was so close to getting out of it. There were runners on first and second with one out after a Carlos Santana double. After a Nick Williams RBI groundout, Syndergaard was well in position to get out of a tough inning with the Mets still having a 2-1 lead. Surprisingly, Syndergaard, who typically has excellent control, immediately went 3-0 against Rhys Hoskins. He battled back into the count in what was an eight pitch at-bat where he then couldn’t put Hoskins away. On the eighth pitch, he walked Hoskins. That walk proved important. With Aaron Altherr down 1-2 in the count, Hoskins broke too early for second, and it looked like he was picked off. The ball went to second with Asdrubal Cabrera covering, and he walked back Hoskins while keeping an eye on Santana. After Cabrera flipped it to Adrian Gonzalez, Hoskins ran out of the baseline (not called), and Santana beat Gonzalez’s throw home. The game was tied at 2-2. At that point, Syndergaard wasn’t going to be able to make it through five innings, and the Mets offense had just one hit after the Cespedes homer. This made this the type of game you’d expect the Mets of very recent vintage to blow. However, Robert Gsellman came out of the bullpen and gave the Mets a lift. He was nearly as impressive as Seth Lugo was yesterday throwing two hitless innings while striking out three. Like Lugo, Gsellman gave the Mets a shot in the arm and a real chance to win. That chance came in the sixth when Nola, who was infamously lifted by Gabe Kapler on Opening Day after 5.2 innings, walked Cabrera to start the sixth. After a Gonzalez lineout, Andrew Knapp error, and a Kevin Plawecki ground out, Wilmer Flores pinch hit for Gsellman and drew a walk. That’s where Amed Rosario, who has hit ninth in every game he has started on the young season, was in prime position to deliver the big hit. Rosario did a nice job going the other way with the pitch, and he was able to line the ball over Williams, who was playing aggressively in in right field. The end result was a two run triple giving the Mets a 4-2 lead. The Mets bullpen, who has had an incredibly strong start to the season, stepped up and shut the door. Believe it or not, that started with Hansel Robles striking out the side in the seventh. AJ Ramos and Jeurys Familia would each pitch a scoreless inning a piece to preserve the Mets 4-2 win. And yes, it is April, which is way too early to focus on these things, but the Mets are now traveling to Washington a half game up in the division and with Jacob deGrom on the mound. Game Notes: This game was broadcast only on Facebook with former Phillie John Kruk and former Met Cliff Floyd doing the color commentary. With Michael Conforto being activated from the disabled list, Phillip Evans was optioned down to Triple-A. He was 0-3 with a strikeout and a GIDP. Like seemingly every Major League team, the New York Mets are interested in obtaining the Japanese Babe Ruth – Shohei Ohtani. While it is good to hear the Mets are in fact interested in entering the race for the pitcher/hitter, no one should expect the Mets to get him. This isn’t a financial reason either. Ohtani comes with a $20 million posting fee which is only accepted by the team who is deemed to have one the claim. The Mets can only offer him a bonus from their international bonus pool which currently stands at $150,000. This pales in comparison to the $3,535,000 the Rangers could offer him or the $3,250,000 the Yankees could offer him. Now, the Mets don’t have the pool money those teams have because the Mets have spent their money acquiring players. The one caveat here is if Ohtani really wanted to come to the Mets, the Mets could very well trade for additional pool money. The issue is why would Ohtani want to come to the Mets? Given the Collective Bargaining Agreement constructs, Ohtani is going to make roughly the same amount as T.J. Rivera did last year. If he waited two years, he’d possibly get Giancarlo Stanton‘s contract. In many ways, you could argue, Ohtani isn’t motivated as much by the money as he is by the chance of accomplishing his dream of playing in the majors. For him, that means both pitching and hitting. Likely, that means Ohtani belongs in the American League where he could DH on a somewhat regular basis. During his five year career in the Japanese Leagues, his positional breakdown was as follows: P (85 G), RF (57 G), LF (7 G), DH (256 G). Consider for a moment, Ohtani has not appeared in the outfield since 2014. There are a few reasons for that including Ohtani’s recent medical history. A bigger reason is a team does not want their top of the rotation starter airing it out in right field to try to nail a runner at the plate, nor do they want that pitcher diving to catch a ball and risk the injuries we have seen Juan Lagares suffer the past few seasons. You could argue this could lead a team to try to move him to first base. However, if you view Ohtani as a top of the rotation starter, would you be willing to risk a Cliff Floyd – Todd Hundley type of collision? There is next to no chance you would do that, and that is even before you consider a team not wanting to waste teaching Otani a new position in lieu of working with his new pitching coach. As much as National League teams want Ohtani, they really can’t afford the risk of playing Ohtani everyday. You don’t want him in right field a day after he threw 100 pitches. Accordingly, there are some necessary off days he is going to need. Every National League team knows this, including the Mets. Ohtani and his agents know this as well. If Ohtani really wants to pitch and hit, he’s really limited to the American League where he can DH on the days he’s not starting. Of course, there is still every possibility Ohtani really does want to do it all, which would include fielding. To be fair, there haven’t been comments from Ohtani regarding his wants from that regard. Still, if you were a betting man, you would likely bet on Ohtani choosing an American League team because that is the team best suited for not only his talents, but also for his own personal goals. If that is the case, while we can point fingers at the Mets for missing out on players over the years, they will not be to blame for missing out on a once in a generation type of talent. If you ask a New York Giants fan about the postseason, they will reminisce about Super Bowl XLII and XLVI. You will hear about the Helmet Catch and Eli hitting Manningham down the sideline for 38 yards. You know what you don’t hear about? Fassell having the Giants ill prepared for Super Bowl XXXV or Trey Junkin. The reason is simple when you win, you remember it forever. However, when you lose, and you lose and lose, that memory festers and worsens year to year. For years and even until this day, you will occasionally hear Howie Rose bemoan Yogi Berra‘s decision to go with Tom Seaver on short rest over George Stone in Game 6 of the 1973 World Series. One of the reasons that memory lingers is the Mets where irrelevant from 1974 until 1984. After 1986, Mets fans were in their glory, and to this day many fans who got to live through 1986 talk about it as fondly today as they probably did when they got to work on October 28, 1986. Davey Johnson botched that series including leaving in Dwight Gooden too long in Game Four. Doc would allow a game tying home run in the top of the ninth to Mike Scioscia. It was the last hurrah for Gary Carter and Keith Hernandez who struggled over the final few games of the series, and respectively faced poor and injury plagued 1989 seasons before finding new homes in 1989. First and foremost, the one thing that should stick out was how those Braves teams just tortured the Mets, and the Mets could never get past them. Both John Franco and Armando Benitez blew leads in Game 6 preventing the Mets from sending the series to a seventh game and letting the Mets be the team to do what the Red Sox did to the Yankees five years later. Kenny Rogers walked Andruw Jones with the bases loaded to end the series. The subsequent two seasons followed with epic collapses with Tom Glavine not being devastated and an inept Jerry Manuel going to Scott Schoeneweis who gave up the homer that closed Shea for good. Terry Collins making terrible decision after terrible decision. Yoenis Cespedes a no-show from the very first defensive play of the World Series. Jeurys Familia blowing three saves even if they weren’t all his fault. Daniel Murphy overrunning a ball. Matt Harvey for too long in Game 5. The list for the aforementioned series really goes on and on, but those were just some of the highlights. After tonight’s game, that is what Astros and Dodgers fans will be doing. They’ll be asking if Dave Roberts was too aggressive with his pitching changes while A.J. Hinch was not aggressive enough. Why didn’t Chris Taylor try to score, or why could Josh Reddick just put the ball in play. Really, the list goes on and on. For one fan base, they will focus on the things that went wrong. Considering the Dodgers haven’t won in 29 years and the Astros have never won, the pain of this loss is going to hurt all the more. For the fanbase that gets to win this one, they will have memories to cherish for a lifetime, and they will never again be bothered by the what ifs that could have plagued their team in this epic World Series. As the Mets head to the trade deadline, this team is clearly in a position to sell, and they should look to sell every player they have on an expiring deal. Certainly, if the Mets are offered a good return for Curtis Granderson, the team should trade him. But with him being 36 years old and with his being a fourth outfielder at the moment, are teams really going to offer the Mets something of value for Granderson? At this point, it doesn’t appear likely. And in some ways that’s actually good for the Mets. At the trade deadline, it is eminently possible, the Mets will move Jay Bruce, Asdrubal Cabrera, and Lucas Duda. If the Mets are able to move these players, it will create an opportunity for the Mets to play Gavin Cecchini, Brandon Nimmo (once he returns from the Disabled List), Amed Rosario, and Dominic Smith. It will be a small sample size, but we will find out if these players are ready to be big pieces of the Mets in 2018. One of the ways the Mets can make their transition to the majors smoother would be to have a strong veteran clubhouse presence to show them what it takes to succeed in the major leagues. We saw how Cliff Floyd took a young David Wright under his wing, and we have seen Wright become the consummate professional. Obviously, you would want Wright to be that for another player. Unfortunately, with the myriad of health issues he faces, it is difficult seeing him be that player. With that being the case, the best player to do that for the Mets would be Granderson. And really, who better than Granderson? In his time with the Mets, he has done everything the team has asked. He’s moved all over the batting order. The team has shifted him across the outfield. This year, they made him the fourth outfielder despite his arguably being one of the top three outfielders on the roster. This is exactly the type of guy you want around your young players. You want them speaking with Granderson. You need to have Granderson showing them what it takes to succeed in the major leagues. It is also a reason why you want to keep Granderson beyond this season. Re-signing Granderson not only means you’re bringing back the player. It also means you are bringing back the man. The man who does everything right on and off the field. He is a model human being that has played in New York for eight years. He should be telling players how to prepare for a game, how to deal with teammates, how to balance being a ballplayer and helping your community, and how to deal with the press. Having Granderson around will help put the young players in a position to succeed. Another consideration is you probably need Granderson the player next year as well. Considering Granderson will be 37 next year, it is not likely he will get many offers to be a starting outfielder. In fact, he may very well get none. If that is the case, re-upping with the Mets is likely his best bet. Since coming to the United States, Yoenis Cespedes has had chronic leg issues. We have seen that arise the past two seasons with Cespedes landing on the Disabled List. While he’s still young, Michael Conforto has been snake bitten a bit with a wrist issue last year and a bone bruise this year. Certainly, with their health issues, you want a fourth outfielder whom you can trust to play everyday. You can trust Granderson. Look, if the Mets are blown away with a trade offer, you have to trade Granderson. If Granderson gets a starting outfielder job, especially one for a contender next year, he has to take it. With both situations unlikely, the Mets should be talking about a contract extension with a player who they need to have a profound impact next season. The Veteran’s Committee, which has been re-branded as the Today’s Game Era Committee, somehow elected former commissioner Bud Selig into the Baseball Hall of Fame. With that, Selig becomes one of the worst choices for the Hall of Fame in baseball history. Sure, his proponents will point to his achievements. Under Selig, we got the Wild Card and Interleague play, which arguably helped baseball achieve higher ratings and revenues. Furthermore, Selig was in charge when MLB Advanced Media (MLB AM) was established. The establishment of the internet media company was visionary and has provided a huge boost to MLB. Under Selig’s stewardship, we have seen labor peace for the first time and incrementally improving steroid testing. These are all achievements to be sure, but they overshadow what has been a largely negative tenure in baseball for Selig. Selig first became an owner in 1970 when he purchased the Seattle Pilots, and he moved them to Milwaukee after the Pilots inaugural season. Selig was then one of the owners who colluded in the 1980s to suppress players salary and movement between teams. At this time, future Hall of Famers like Carlton Fisk, Phil Niekro, and Andre Dawson were having a difficult time just getting a free agent offer. This was a pattern that continued throughout the decade, and eventually, it led to union filing grievances against the owners. Eventually, this led to owners having to agree to a $280 million settlement to the MLBPA. It has been alleged Selig was one of the leaders of the owner’s collusion to improperly restrict player movement and to suppress player salaries. It just so happens that a small market team like the Brewers were beneficiaries of the policy with the team being able to hold onto future Hall of Famers Paul Molitor and Robin Yount for much longer than they probably would have had the system not been improperly rigged. This collusion set the stage for the disastrous 1994 player strike. As Commissioner, Fay Vincent would make two “mistakes” that would lead to the end of his tenure. The first was he treated players like an equal part in the business of baseball. The second was he chastised the owners for collusion saying, “The single biggest reality you guys have to face up to is collusion. You stole $280 million from the players, and the players are unified to a man around that issue, because you got caught and many of you are still involved.” (metsmerizedonline.com). This along with many other reasons designed to help his franchise, the Milwaukee Brewers, was a catalyst for Selig organizing the owners to remove Vincent from power. Ultimately, the owners made an 18-9 no confidence vote, and a humiliated Vincent would resign from his office. This led to Selig’s rise to power. One of the singular owners responsible for collusion and the deep distrust between the players and owners was now in charge of baseball. With his newfound power, he wanted to usher in a complete change in economics and relationship with the players. In effect, he wanted to normalize the collusion practices of the 1980s by trying to impose a hard cap on the players. He and the owners tried this despite having full knowledge this was a non-starter for a union the owners never broke in negotiations. The method Selig sought to try to break the union was to wrongfully withhold a payment to the players’ pension and benefits plan. This singular action was the proverbial straw that broke the camel’s back, and it all but forced the union to set a strike date. After the strike was in effect, and after mediation proved ineffective, Selig, as acting commissioner, set forth a deadline of September 9th. If there was no deal in place, the baseball season would be over. On September 8th, the players set forth a deal with some concessions. However it should be noted those concessions fell far short of all the demands of the owners, including but not limited to a salary cap. The owners never presented a counter-offer. Rather, on September 14th, the World Series was officially cancelled despite there presumably being sufficient time left on the calendar to get a deal done and have a postseason. With the strike dragging on and there being no hopes of new Collective Bargaining Agreement, the owners, led by their acting commissioner, Selig, enacted the salary cap they wanted in the first place. Undaunted, the owners announced a plan to go forward with the 1995 season using replacement players if the major league players on strike could not capitulate to the new labor rules the owners were trying to force upon them. Like with owner’s collusion attempts, this would have near disastrous consequences. First, the issue of the owners colluding once again went before an arbitrator. The arbitrator found in favor of the players to the tune of $10 million. Next, Congress nearly revoked baseball’s anti-trust exemption. Lastly, the owners were found to have committed unfair labor practices. As a result, future Supreme Court Justice Sonia Sotomayor issued an injunction against the owner’s improper salary cap, and ordered that the players could return to work under the guise of the recently expired collective bargaining agreement. In effect, the owner’s action, under the guidance of Acting Commissioner Bud Selig, led to the loss of the World Series and $10 million dollars. Moreover, it led to fan anger, and it deeply hurt some franchises. For all of that, the owners accomplished nothing. At the time of the strike, the Expos were the best team in baseball with a 74-40 record. It looked like the beginning of a promising run for the Expos because not only did they have the lowest payroll in the majors, they had some exciting young stars in Cliff Floyd, Moises Alou, Larry Walker, Pedro Martinez, and John Wetteland. For a Canadian franchise that just saw its fellow Canadian franchise, the Toronto Blue Jays, win back-to-back World Series, it appeared as if it was finally the Expos turn. After the costly strike, the Expos were forced to trade away almost all of its players. As the Expos owners at the time put it, they could not afford to keep the team together, especially without the revenues that could’ve been generated by a long postseason run. Between the anger with the strike and with the Expos getting rid of all their best players, there simply was no reason for fans to come to the ballpark anymore. Ultimately, the Expos attendance figures would continuously decline until they actually drew under one million people in 1998. The declining attendance figures helped Selig come up with his next ploy that would not only help the Brewers, but would also anger fans in other cities – contraction. In the 2001 offseason, the owners voted to have the ability to contract as many as two major league franchises. The teams cited for contraction were the Tampa Bay Devil Rays, Florida Marlins, Montreal Expos, and Minnesota Twins. Effectively, this created a game of musical chairs and the ability to help coerce cities to fund ballparks. First, the Marlins owners were part of a group of owners that purchased the Boston Red Sox. With the Marlins needing ownership, the Jeffrey Loria, a man who had claimed almost full ownership of the Expos, was then approved as the purchaser of the Florida Marlins. With an ownership void, baseball took the unprecedented act of purchasing the Expos. It should be noted smaller market clubs like the Pirates and the Brewers were not among those mentioned in contraction talks despite their claims of their operating in the red. The main reason is those cities had already agreed to build those teams a new ballpark. Eventually, the cities of Minneapolis and Miami would agree to financially support owners to build a new ballpark. With the hopes of building a new ballpark in Montreal dashed, baseball eventually moved the Expos to Washington, D.C. who had agreed to take on the funding of a new ballpark for the team. Between the strike and contraction threats, Selig helped kill baseball in Montreal. He did it as part of his mission to get municipalities to fund and build ballparks for teams. Overall, he has been largely successful on that front, but there are still issues in Tampa (lease) and Oakland. As an aside, it should be noted that the Expos were one of the few teams to lose a superstar during the collusion practices of the 1980s. Basically, the practices Selig either led or helped promote had an enduring effect of harming baseball in Montreal. O.co Coliseum is largely seen as an antiquated ballpark. Moreover, it is widely assumed the Athletics need to build a new ballpark to help create new revenue streams in order to be able to compete financially. Many assume the Athletics need to move out of Oakland in order to get the type of ballpark and market needed to compete. On both fronts, the Athletics found a willing partner with the City of San Jose. There is just on problem – the San Francisco Giants have the rights to that city. Under somewhat antiquated rules, the San Francisco Giants have the rights to San Jose meaning only the Giants have the right to move there. This decision was in place despite the cities of San Francisco and Oakland being part of the larger metropolitan area known as the Bay Area. Notably, San Jose is also part of that area. To put things in perspective, the distance between the two ballparks is 15.3 miles. Citi Field and Yankee Stadium are similarly apart in that the two ballparks are 9.7 miles apart. Similar to Oakland and San Francisco, you need either use public transportation or cross a bridge to get to the other ballpark. Keeping those distances in mind, the Giants having control over San Jose would be like the Yankees having control over Northern New Jersey, thereby preventing the Mets from building a ballpark in the Meadowlands next to Metropolitan Stadium even though the team is moving within the same metropolitan area. Note, this could never happen because the Mets and Yankees do not have separate territorial rights. Yet, somehow the Giants and Athletics do, and with baseball’s anti-trust exemption, the Athletics franchise has been in limbo. Despite the limbo, the declining revenues, and attendance, Selig refused to help address the issue despite San Jose’s pleas. Selig had an opportunity to show leadership, and help all of the major league franchises. Instead, he demurred while bemoaning how the Athletics current situation is irreconcilable. With Selig’s retirement, he has left the mess for the new commissioner, Bob Manfred. To say baseball didn’t benefit from the Steroids Era would be a lie. Back in 1998, Mark McGwire and Sammy Sosa were chasing down Roger Maris‘ single season home run record, and fans angered at the strike were coming back to the game. At the time, Selig would say, “This is a renaissance.” (Howard Bryant, ESPN.com). Now, to be fair to Selig, as the commissioner, he could not unilaterally impose sanctions on players who used steroids. Additionally, he could not impose testing. It should also be noted Selig did have broad discretion to do this with the minor leagues, and he did in fact do it. To that end, he does deserve some credit. With that said, it is noticeable Selig did not use his pulpit as commissioner to try to impose steroids testing or suspensions. As seen above, when it came to the financial aspect of baseball, Selig tried to obtain unprecedented power. In the wake of the costly collusion lawsuit, he helped oust a sitting commissioner to become an acting commissioner. During the 1994 strike, he led the owners in the implementation of a salary cap. When it came to helping owners and getting new ballparks, he got the approval from the owners to contract two major league franchises. However, suddenly, with steroids, Selig was not only silent, he has also acted as someone who had little power to address the issue. Fact is Selig didn’t address the issue because there were growing attendance and revenues stemming from the Steroids Era. It helped heal some of the wounds of the strike, and it led to larger and larger television contracts. At best, Selig turned a blind eye to steroids use because it was helping the game. At worst, he was a willing participant who cared not for the sanctity of baseball’s sacred records. Whatever you believe, the Steroids Era is an indelible part of his history. And yet, with his induction into the Hall of Fame, he now appears to be the only person untainted by the era. result, an environment developed in which illegal use became widespread. Despite the Mitchell Report, the Hall of Fame has decided to take two very separate and distinct stances on McGwire. With respect to the steroids usage, the Hall of Fame is now asserting that any player who benefited from the use of steroids should be barred from the Hall of Fame. However, any executive or owner who not only shared the benefits of McGwire’s steroids use, but also helped promote a culture of steroids use across baseball could reap the benefits thereof. Overall, the Hall of Fame has decided that Selig can benefit from the wrong actions of players he did little to nothing to stop. It is really difficult to make sense of two very different positions. No matter how you look at it, Selig’s enduring legacy is going to be: (1) he was the commissioner who cancelled a World Series; (2) he was the commissioner that presided over the Steroids Era; and (3) he is the commissioner that introduce Interleague Play and the Wild Card. As seen above, Selig’s is a complicated legacy, and that is before you get into relatively minor decisions like not letting the New York Mets wear the first responder’s caps on 9/11 to honor those people who died during the most devastating terror attack on U.S. soil, forcing the McCourts to sell the Los Angeles Dodgers, or his empowering the Wilpons to continue ownership of the Mets despite their financial difficulties resulting from the Madoff Scandal. Maybe it is too soon to judge Selig’s overall legacy. On the positive, he has grown the sport financially, and he has introduced some aspects to the game that are currently seen as positives. No one should overlook those accomplishments. However, Selig was an owner who helped build distrust between the owners and players than helped create the 1994 strike and the cancellation of the World Series. His actions and inactions as commissioner caused him to be called before a Congress who continuously threatened to revoke baseball’s antitrust exemption. Selig presided over the end of baseball in Montreal, and he also has helped put the Athletics in limbo. He has twice been a part of the sport being embarrassed with the owners twice being found to have committed unfair labor practices. The actions cost the owners nearly $300 million not including whatever revenues were lost during the 1994 season. Was partially culpable for the Steroids Era. It is hard to find a person in baseball who has had as negative an effect upon the game of baseball. However, all of this was overlooked, and he was inducted into the Hall of Fame presumably because he made a lot of decision makers a lot of money. Baseball is funny. There was about a four month stretch where watching Mets baseball was a tedious and frustrating exercise. It was about as painful as watching Yoenis Cespedes try to play on an injured quad. Speaking of pain, seemingly everyone got hurt. Of all the people in the Opening Day lineup, only Curtis Granderson and Michael Conforto didn’t wind up on the disabled list at some point. With Conforto making two trips to AAA, that left Granderson as the only Met starter available all season. We saw something similar last year. However, we saw last year that a team can make it to the postseason with some big trade deadline moves, a weak schedule to finish the season, and tremendous pitching. Well, the trade deadline wasn’t the boon it was last year. Jay Bruce would struggle mightily until the last week of the season. The starting pitching we all expected wasn’t there. Matt Harvey was never healthy and needed season ending surgery. Zack Wheeler had multiple setbacks during his Tommy John rehab, and he wouldn’t pitch this year. Both Steven Matz and Jacob deGrom pitched with injuries until they couldn’t anymore. Both had season ending surgeries. Speaking of season ending surgeries, the Mets also lost David Wright to cervical fusion surgery and Neil Walker to discectomy. Speaking of bad backs, Lucas Duda was nowhere to be found for most of the year with him suffering a stress fracture in his back. Still, the Mets made it back to the postseason. They did take advantage of that weak season ending schedule. Since August 20th, the Mets have the best record in baseball. How did we get here? Well, Noah Syndergaard and his 95 MPH slider had a Cy Young caliber season. Bartolo Colon had his best season as a Met. Addison Reed and Jeurys Familia were the most dominant 8-9 combination in all of baseball. Seth Lugo and Robert Gsellman became not only unlikely contributors, but also reliable starters in the stretch run. Offensively, Asdrubal Cabrera became the best hitter in all of baseball the final month of the season. Cespedes got healthy, and Granderson regained his stroke. Wilmer Flores and Kelly Johnson combined to reasonably replicate Walker’s production until Flores got hurt and Johnson regressed. At that point, T.J. Rivera took complete advantage of the opportunity with the 27 year old undrafted rookie playing solid defense and spraying line drives all over the field. And yes, Jose Reyes returned to the Mets after his domestic violence issues to play better than anyone could’ve reasonably expected. That coupled with the Giants and Cardinals playing sub .500 ball, the Mets had their 1973 window, and the Mets took full advantage. All they needed to do was win one more game. Fittingly, Colon got the start (pun intended). He’d get a 2-0 lead off a pair of RBI singles from Rivera and Reyes. As he has seemingly done all year, Reyes scored Travis d’Arnaud from second. As usual, it was a questionable send by Tim Teufel as the ball beat d’Arnaud to the plate. Fortunately, the throw was to the first base side of the plate, and d’Arnaud made a nifty slide to just avoid the tag. That’s when ghost of Phillies past Ryan Howard tried to put a damper on the party by hitting a game tying two run home run. Up until the Howard home run, he was cruising and showing no ill effects from his tendon injury. He also had a Cabrera impression with an impressive bat flip. Yoenis Cespedes got himself tossed out of the game by dropping an F bomb. Apparently it could be heard in the dugouts. Reed and Familia locked down the eighth and ninth inning for the 51st time this season, which is by far the most in the majors. The last out was recorded by Conforto making a sliding catch in left. The last time a left fielder with the number 30 caught the clinching out was Cliff Floyd in 2006. Hopefully, these Mets can have a long playoff run like that team. Honestly though, we’re hoping for more than that. With that, the 2016 Mets completed their 1973 Mets regular season run. Now comes the hard part. That begins Wednesday with Syndergaard taking the mound against either the Giants or Cardinals in the winner take all Wild Card Game. Right now, if you were going to list what the Mets problems were, two things that would be discussed ad nauseaum would be the offense and hitting with runners in scoring position. While it has not been discussed as frequently, Yoenis Cespedes‘ and Juan Lagares‘ injuries also make center field an issue for the Mets. The Mets acquisition of Jay Bruce presumably solves the first two Mets problems while only further confounding the center field issue. First, the offense. There is no doubt that Jay Bruce is your classic left-handed slugger that should be hitting in an RBI position in your lineup. This year Bruce is hitting .265/.316/.559 with 22 doubles, six triples, 25 homers, and a major league leading 80 RBI. He also isn’t a Great American Ballpark creation as Bruce has hit better on the road. In road games, Bruce has slashed .277/.318/.582. More importantly to Mets fans, Bruce is hitting .360/.406/.719 with runners in scoring position. Ideally, the Mets would bat him fifth in the lineup as Bruce has been hitting .290/.340/.603 from that spot in the order. Still, there is some cause for concern with Bruce. As we see with his stats, he is not nor has he ever been a great on base guy. He is also a guy who is a platoon type of bat as he is hitting .250/.287/.491 off of lefties this year. With that in mind, the Mets might have just added a player that is more of the same. He is also coming off two straight seasons that saw him hit a combined .222/.288/.406 while averaging 22 homers and 76 RBI. If his July, where he hit .218/.289/.529, is any indication, he might be becoming that type of player again. Furthermore, Bruce has not hit well at all in Citi Field. In 21 games, Bruce has hit .186/.275/.443 with five homers and 13 RBI. Hopefully, some of that is a short sample size and some of that is Matt Harvey, Jacob deGrom, and Noah Syndergaard. Regardless, Bruce is an offensive upgrade for an injured and under-performing Mets team. However, he is not a defensive upgrade for a team that needs a center field solution. If reports are true, Bruce is being brought here to play right field rather than to play first base in place of James Loney. That would shift Granderson from right to center. As we saw in the one game Granderson played in center this year, there is a reason why he has not played center regularly since 2012. The other issue is that while Granderson has had a down year defensively in right field, he has been much better than Bruce, who has posted a -11.5 UZR and a -13 DRS this past year. Over the previous two seasons, Bruce has averaged a -5.2 UZR and a -1 DRS meaning he is worse this year than he has been over his career. With Bruce’s struggles, Granderson’s inability to play center, and Yoenis Cespedes playing on one leg, this outfield should be reminiscent, if not worse, than the Cliff Floyd–Roger Cedeno–Jeromy Burnitz outfield that was seen as an unmitigated disaster defensively. The other issue is where does this leave Michael Conforto? After everything that has happened this year, are the Mets really going to make him a bench player? Is he going to platoon with another left-handed batter? Does he move to first base? Aren’t you now forced to send him down to AAA until September call-ups? This really leaves your best young hitter and future of your team in a lurch. With all that in mind, it is a very curious move, especially when there was no corresponding move to address any of the Mets other needs. 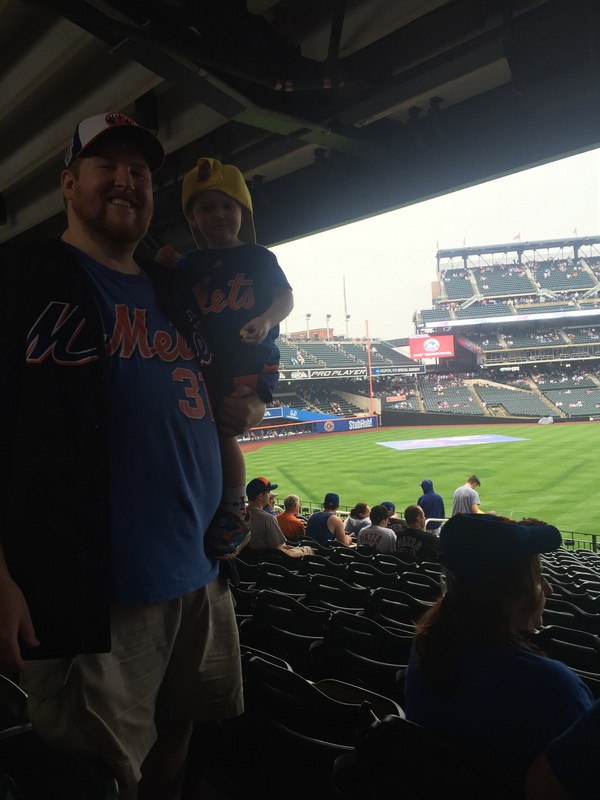 Overall, Bruce solves some of the Mets problems while exacerbating some others. The best way to deal with all of these issues is for both he and his new teammates to just go out there and hit. It was a muggy and rainy day that might’ve lead to the game being called on any other night. But they weren’t going to call this game as it was the night the Mets were retiring Mike Piazza‘s number 31. With the 31 inside a home plate mowed into centerfield, the Mets were ready, and nothing was going to stop the night. We had to visit it after the game. Then Piazza would come through the Mets dugout that seemed to have most of the players there, and the crowd erupted. Every little touch was perfect from the aforementioned 31 in centerfield to his 31 prominently featured on the Home Run Apple. 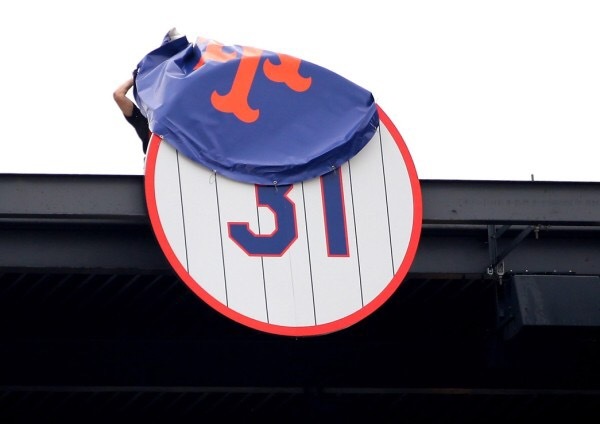 The only thing missing from the tribute was Mets fans giving him a curtain call after he homered off former teammate and fellow Hall of Famer Pedro Martinez. Speaking of former teammates, there was some surprise that there weren’t more of his old Mets teammates there. Frankly, I was shocked there was no John Franco, but you don’t know the scheduling issues that would prevent people from coming. For example, you know White Sox manager Robin Ventura would never be able to make it. 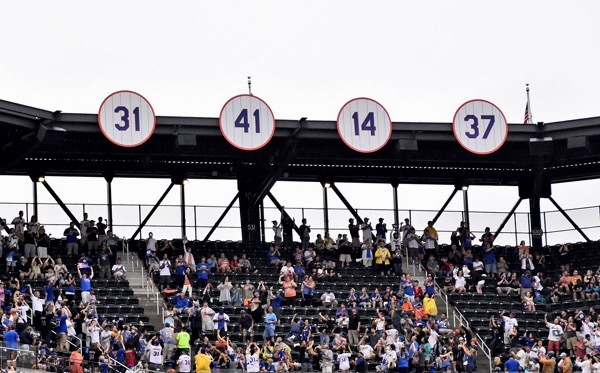 Piazza honored everyone including the fans. 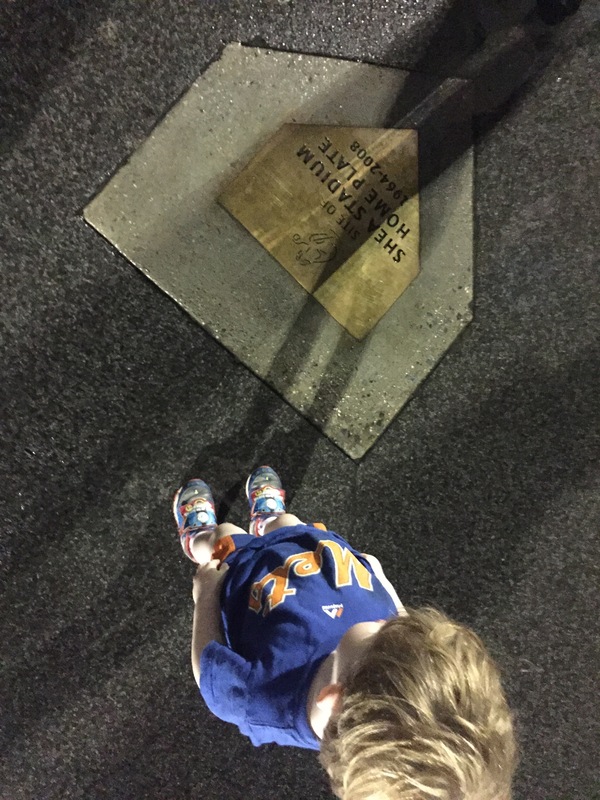 He took in the moment as Mets fans did as well. His induction to Cooperstown was a coronation, but this was a celebration with 42,207 of his closest friends. There would be no roomfor booing as Piazza would remind the fans when he brought up the Wilpons. 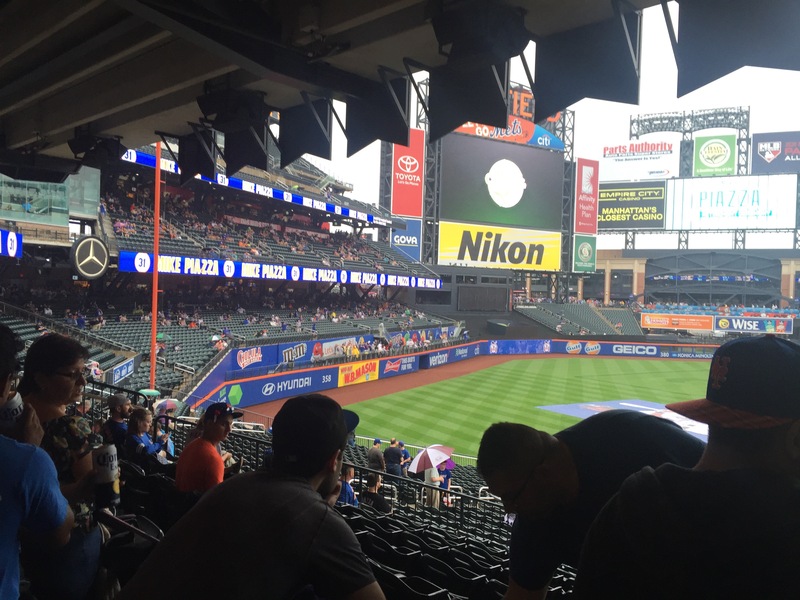 That’s the power of Piazza – he can get the fans to stop booing the Wilpons. He gave a poignant speech letting the fans know that for as long as his 31 hangs in Citi Field, he will be with all of us. As he parted, he tried to inspire everyone saying that whenever the team needs inspiration, they need only look up to left field and remember that old Mikey is with them. 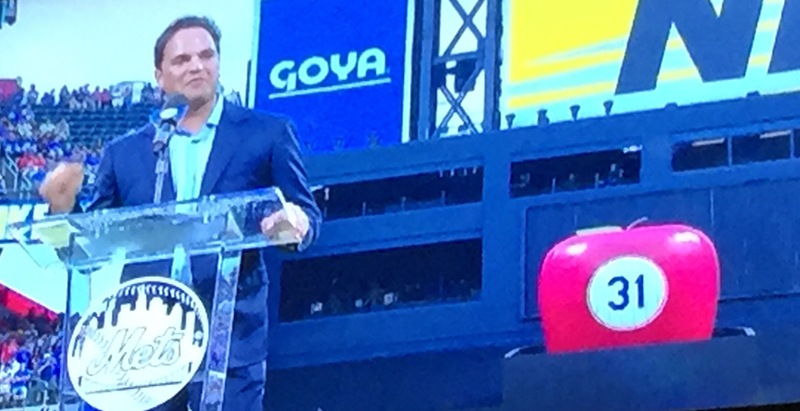 Yes, there were some jokes about Piazza not doing it to Alfonzo at second. The real joke was what followed. The team either didn’t listen or was too undermanned to draw from these inspirational words. The game itself. It was never going to match the beauty of that ceremony, but it didn’t need to be that ugly. The team never heeded his parting advice. Given how the Mets have been playing, and the lineup that was put out there, the loss was no surprise. The Mets starter AAA cast-off Justin Ruggiano in center, a reall defensively challenged Kelly Johnson at first, a 43 year old Bartolo Colon on three days rest, and of course Neil Walker. Not even facing the worst starter in baseball Jorge De La Rosa could revive this offense. It was just a brutal game that saw Terry Collins get tossed in the fourth, and frankly, most Mets fans didn’t stay for much longer than that it a 7-2 loss. Overall, the only thing worse than the loss was knowing that Tom Seaver was physically unable to attend the ceremony. It was still a great night, and years from now, I will always remember seeing this for the first time. Game Notes: Jose Reyes was put on the DL before the game.